Principles - Nioka has been involved in horses all of her life. Her background in horses has been showing, dressage, general stud work and breeding. Nioka and her partner decided around three years ago to breed a thoroughbred in the hope of racing it so they could have a little fun. From there the obsession has grown to 11 broodmares and now standing their own stallion at stud, the regally bred "Ustinov" (Seeking the Gold x Let's Elope). History of the farm – Moorookyle Park was developed 3 years ago on the family farm situated 5min out of historic Smeaton and 15min from beautiful Daylesford in Victoria. The farm was original used for primary production purposes including cropping, sheep and many years ago Potato production. Since then it has now had 88acres developed into a boutique facility for horses. The land is well known for its superb capabilities for growth of both animals and pastures having some of the most fertile soils in the region and reliable rainfall coupled with a warmer climate than nearby Ballarat. All of our paddocks are fenced with horse safe fencing catering to all needs from foals, broodmares, fillies and colts. 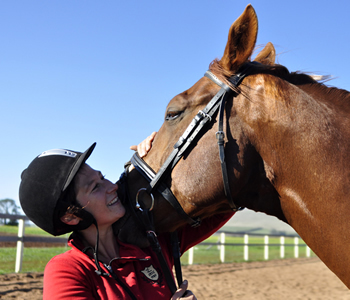 All paddocks have horse shelters and horse friendly pastures developed with leading agronomists that have worked in the horse industry and have a keen understanding of the nutritional needs and development requirements for the growing thoroughbred. We work closely with horse nutritionists to make sure that the blend of quality horse feed we use is consistently meeting the needs of all of our horses. Particular attention is paid to the handling of young horses with all foals being handled extensively from birth.